This is my beautiful daughter. She is a kick in the pants and absolutely one of my very favorite people. She is so entertaining, funny and smart at a whip. I know, I’m bias. However, other people say the same thing. This girl LOVES Pie Crust Cookies. They are her favorite. She actually ate every one of the cookies on that plate. So, I make her these cookies anytime I have some spare pie crust. The last time I had pie crust, it was to make this Southern Pecan Pie, which is amazing, if I do say so myself. I like to use a silicone mat on my cookie sheets. It helps your food not stick and you don’t have to use extra oil. So nice. Plus, your food doesn’t stick to the pan. So wonderful for clean up. Roll the pie crust out to about 1/8 inch thickness. Cut your cookies out the crust and place on cookie sheet, about 1/2 inch apart. While the cookies are cooking, combine the cinnamon and sugar in a small bowl. Brush each cookies with butter. Sprinkle the cinnamon sugar on half of the cookies and the pumpkin pie spice on the other half. I hope this will give you an idea for that left over pie crust. These cookies sure are tasty. 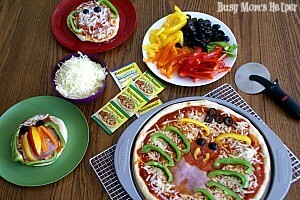 Come on over to Fearlessly Creative Mammas and see what else we are cooking up. 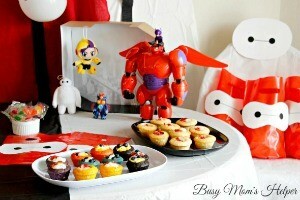 What is something fun and unusual you make for your family? I’d love to hear about it. Merry Christmas, Mamas! Today I’m sharing a Kid-Friendly Christmas Cake-Topper that you and your kiddos can enjoy making, just in time for the special day! I’m Lynn, from Riggstown Road, and if your life is anything like mine, you have some enthusiastic little helpers when it comes to baking Christmas goodies. So it’s nice when the things we’re making are easy for little hands. (Side-note: At this point, my helpers are becoming better at this stuff than I am. And I am totally ok with that.) 😉 This cake-topper is easy enough for your preschoolers to participate in, fun enough for your older kids to enjoy, and special enough for all of them to feel proud of. All you need are 3 simple ingredients to create a winter wonderland of trees on top of your favorite cake. 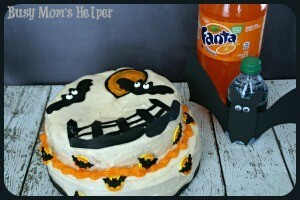 Prepare your cake with white icing. Let kids spread icing on the cones, covering completely. 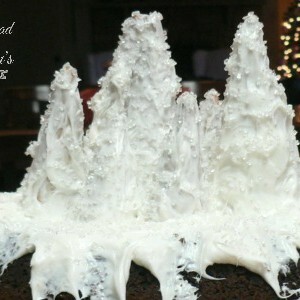 Help kids gently place the “trees” in the “snow” on top of the cake. Kids can sprinkle the sugar crystals all over the trees and the top of the cake to create “ice” crystals. Now stand back and admire the prettiness! Cute enough for company, and trust me, this is waaay easier than decorating cookies! I hope your kids enjoy it, too. Hi there! Kathleen here from Fearlessly Creative Mammas. Summer is almost over, which means the holidays will be fast approaching. Do you enjoy the holidays? Do you make a lot of big meals or go to a lot of pot lucks? If so, I have a dish that you can make over and over again and your friends and family will never get sick of it. My kids and grandkids really love it! It’s a salad of sort, but not your typical salad. 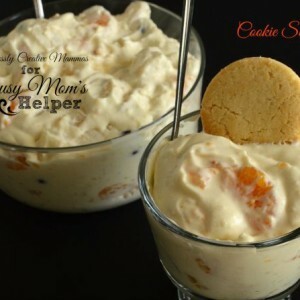 It is called Cookie Salad, so you can tell by the title that it is not typical. It is unbelieveably good though. Believe me. I love doing fun things with my kiddos leading up to holidays, to enjoy the season and get them excited! One of the ways we like to do that is with fun food and recipes, like these Adorable Easter Pudding Cups! I made sure to take advantage of this $0.50 off coupon – saving money makes the holiday even better, right?! Also watch out for special displays featuring the SUPER Snack Packs; they’ll have a recipe tear pad with lots of fun recipes and ideas for Easter! For our Easter pudding cups, I decided to make it REALLY decorated and add some ‘grass’ to the packaging. 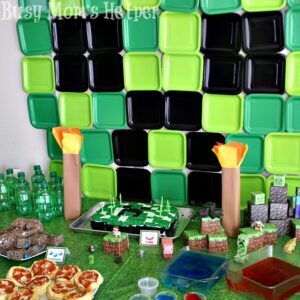 Get some green construction paper (color some ‘texture’ with a green crayon on it, if you want) and wrap it around the pudding cup. Trim the bottom so it’s flush with the bottom of the pudding container, and tape the edges securely. Cut angles all along the top to be the ‘grass’. Now you’re ready to create your super cute Easter pudding cup! Add a layer of the crushed Oreos for ‘dirt’. 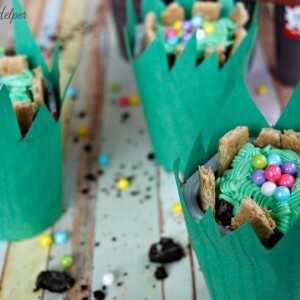 Break your Graham Crackers into little ‘posts’ and insert them along the outside of the cup. Spread the frosting for the ‘grass’, giving it some texture. Add pile of Easter Eggs (colorful candies) and Viola! You’re done! What would YOU add to your pudding cups? My last little Christmas Tree, that I’ve enjoyed on my dresser by my bed, has finally been put away. It’s officially past Christmas and the New Year! Now we’re looking towards Valentine’s Day with lots of romantic enthusiasm, right? 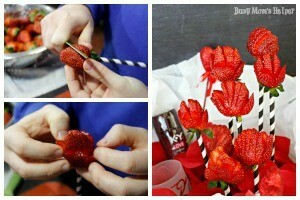 This year I decided to give hubby a little something special for US, this Strawberry Flower Date Night Basket! Since Hubby and my anniversary is the end of January, we usually celebrate that AND Valentine’s somewhere in between the two….it’s easier to find a babysitter! Several years ago, Hubby made me a gorgeous bouquet of strawberry flowers, whipped cream, and chocolate. Seriously, it was FABULOUS! He learned how while cooking in a really nice restaurant, and has since taught me this neat trick. 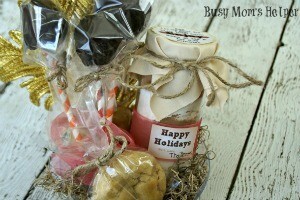 Now, you should make your basket with stuff YOU and YOUR special someone would really enjoy! Some ideas are candies, sparkling cider, candles (I prefer LED ones), perhaps something ‘lacy’ *wink wink* and perhaps even some intimate items, like the new K-Y® Love – exclusive to Target for Valentine’s Day! It’s the holiday of love, for goodness sake, so go ahead and turn up the passion in your relationship! You can even save 10% with this Cartwheel offer through 02/14! Wash & dry your strawberries. Attach a stick or cute straw carefully to the leaf end, not going in too far or it will poke through the top when you do your cuts. To make the rose bud look: Cut a little ‘petal’ on each of the four sides, near the bottom. Don’t cut all the way down or it’ll just fall off. Then make two little slits at the top center, parallel to each other. Spread the petals and the top part, and there’s your bud! To make a tulip-like bud: this one’s really basic, just making cuts parallel all along the berry. Spread them apart slightly, and you’ve got it! To complete my basket, I strung some ribbon along the top rim and lined it with tissue paper. So I could make my berry flowers stand up, I put one of those green floral foam circles and put it into a small bowl. The straws stuck into it easily, making the buds stand up just great at different heights (I trimmed some straws to vary the height even more)! I then covered the ‘green foam’ with fake rose petals. Add the rest of your stuff, scatter more rose petals around because, well, why not? Then you’re set for a romantic evening with your special someone! Two of my kids’ favorite times of day are morning and afternoon snack time. It’s like they measure their entire day around them! Even though we change it around, there are a few things that are their select favorites they’re always asking for. 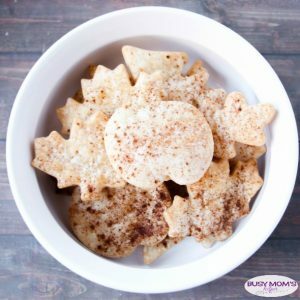 Since I like to give them variety, I’ve found some fun ways to include their favorites in new ways, such as these super fun Cheesy Goldfish Snacks! 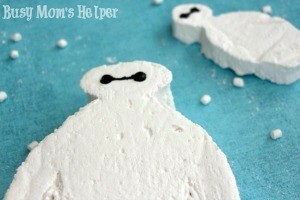 The thing I love most about these is how ridiculously SIMPLE they are to make! Plus, I can make a big batch and stick them in a container in our fridge for later, instead of doing it all right when it’s time for snack. My kids are practically addicted to Goldfish crackers lately, especially since they come in such different flavors! I used their COLORS for these, but it also works amazing with any of the others like Flavor Blasted Xtra Cheddar or Whole Grain. Just swing by the cracker aisle at Walmart to pick up a few cartons! They’re even on Rollback right now! Crush some of the Goldfish crackers, keeping a fun variety of sizes: some super fine, other still pretty chunky. Spread wax paper on a baking sheet (prevents it sticking) or other surface. Melt your cheese, dip in one end up a pretzel stick, then dip that into the crumbs. Place on wax paper to firm up. Store any extras in the fridge because, well, it DOES have cheese, after all! My kids think these are ‘big kid’ snacks….not sure why they call them that, but if it makes them happy I’m all for it! 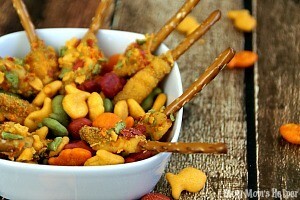 Be sure to check out Goldfish snacks on Twitter and Facebook for more fun and savings!